Having a reliable water filtration system in your home can be quite the valuable asset. Considering the escalating cost of healthcare and the increased risk of pollutants in the water, you can see why your family can be in dire need of a good and reliable RO system. 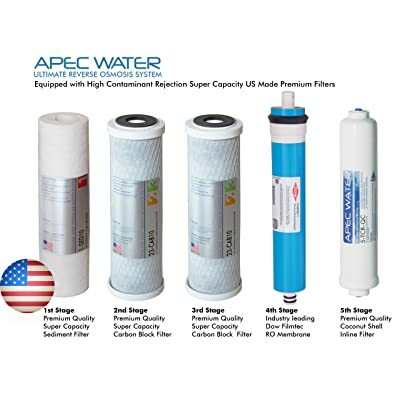 In the event that you have not already invested in this or are looking to replace the one you currently have, you might want to look into the APEC Water – Top Tier – Built in USA – Certified Ultra Safe, High-Flow 90 GPD Reverse Osmosis Drinking Water Filter System (RO-90) system which is not only price friendly but also feature filled and one that you will find quite handy. 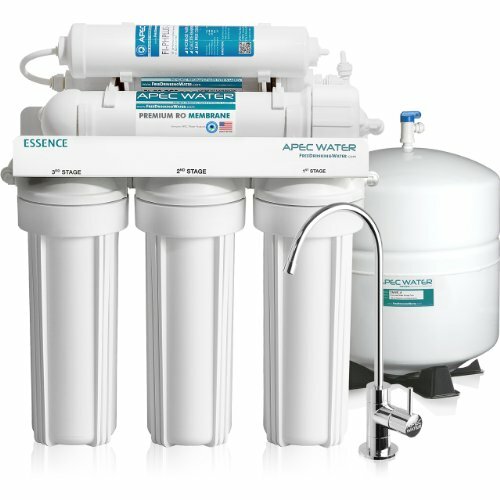 The APEC Water – Top Tier (RO-90) is product of a leading US based company hence you can rest assured that it has been built to standard and with quality products not to mention the fact that it has been built to address the water pollutants that are found in the water in your home. It comes with a 5 stage filtration system that is built with parts that are NSF certified. However, do not be fooled by the fact that this might not have as many filtration stages as the Home Master TMAFC Artesian Full Contact Undersink Reverse Osmosis System, (which has seven stages) it has the ability to remove up to 99% of contaminants as compared to 98% of the Home Master TMAFC Artesian. This goes to show that it is not about the number of filtration stages but rather the quality and effectiveness of the materials used. The APEC super capacity filters are not able to put up staggering numbers but they are also able to out-live the filters of the other brands by double fold. This means that the filters are able to serve you better for longer before they need a change. While most of the filters will go for about 6 months like those of the Home Master TMAFC Artesian, those of the APEC Water – Top Tier RO-90 are able to last up to 12 months. It comes with the original JG quick fit ConnectFittings that do not require any extra locks or clips making it much easier for one to install the system without much effort or skill required. You also do not need to take any extra steps to ensure that there are no leaks. The process is safe, secure and very convenient. 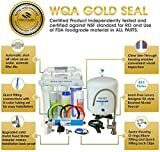 The buyer gets a 1 year customer guarantee with a life time support from a certified WQA specialist to ensure that you never have to contend with problems that might arise while you are using the APEC Water – Top Tier (RO-90) system. Another interesting feature is the set it and forget it worry free system that is automated to allow you get an unmatched experience. What are the benefits that one is bound to enjoy courtesy of the features that come with the APEC Water RO-90 system? Quite a few so to say and the best part is that these are as diverse as the features themselves. The system is quite easy to set up making it quite user friendly and this is made even better by the worry free maintenance system and the fact that the user will have support from a professional. The super capacity filters that last twice as long are very cost effective since they are able to run for longer and with less complications. The quality of water produced by the system is unbeaten and allows for the clearest, cleanest and safest water without mounting a heap of bills enroute to the unmatched performance. One of the biggest concern that most customers have had to express is the fact that the membrane filter housing is quite difficult to open. However, this seems to be a problem in a selected few of the filters so there is no need to worry. In the event that you are not an avid lover of APEC, the iSpring RCC7 75GPD 5-Stage Reverse Osmosis Water Filter System should offer you an alternative that offers you similar performance even though its filters last only 1.5 times as long and not twice. Still, it is a decent alternative. 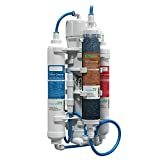 I purchased a cheaper reverse osmosis system a couple of years ago, and had nothing but problems, so I knew that I needed something a little better this time around. I’m glad to report that it’s been a completely different experience. I’m more of a visual learner, so the YouTube videos that the company made for installation were a life saver for me! My husband and I worked together to tackle this project, and we were able to install everything correctly thanks to the combination of the written instructions and the YouTube video. The system has done everything that we wanted it to, and I know that we made a great decision. To let you know why we chose this system over others: we really liked that the filters were all made in the USA. We also liked that we would be able to get new filters for each year for under $40, so there weren’t a lot of long-term maintenance costs. If you are searching for a great reverse osmosis system, you can’t go wrong with APEC! I’ve purchased several systems over the years for my house and my rental properties, and we have never had any issues. Whenever I’ve had questions, customer service is great. This 5-stage system is what I use in my primary residence, and it is impressive and reliable. This ro system has been installed in our house for almost 2 years, and our water tests are consistently great. According to APEC Water, this system gets rid of 98 percent of fluoride on average, so I was especially pleased with the system’s reasonable price once I found out about these test results. However, the biggest success comes every time that we drink our water. Every member of my family is drinking more water now, and this water tastes even better than the bottled water that we used to spend way too much money on. How much room is required under the sink to install the APEC RO-90 5 stage system. The garbage disposal takes up a lot of space on the left side not to mention the drain pipes. I don’t know the exact space the APEC RO-90 takes but I am pretty sure it will fit on the right side, under your sink.